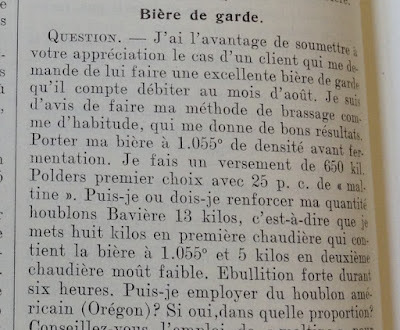 I thought it made sense to discuss George Maw Johnson's 1918 text about a Belgian mashing system suited for low strength beers to follow up on my last scientific/historical post on the Evans 1905 Brewing in France text, in which I also focused on mashing. Johnson had integrated well into the world of Belgian brewing and had gained respect from Belgian brewer-scientists and he was the inaugural editor for one of the leading Belgian brewing journals of the time. In addition to technical details, in this text he does a good job of setting the scene for the mashing procedure he covers with historical context and some driving forces behind this procedure. As with the Evans text and many other British texts of this era, the paper is followed by a discussion between other British brewing scientists/researchers of the time which makes for a great read. Johnson starts by explaining the origins and duration of the Belgian tax law which centered on mash tun size. Many may have heard of this before but if you haven't, Belgium spent about 60 years basing brewing taxes on the size of brewer's mash tuns rather than something sensible like production/strength based like volumes and original gravities of beers, grain quantities, etc. The effect of this law was that it promoted using undersized mash tuns and overloading them with grain, and then devising mashing procedures to extract as much as possible from this mash of abnormal water:grist rations. This tax started in 1822 when Belgium was still under rule of the Netherlands and the law remained in place after Belgian independence in 1830, lasting until 1885. However, after this point it still remained an option for brewers, who for some time were allowed to choose between the mash tun law and a volume*OG-type law for their excise tax format. The text is also written such that it is much more readable than modern scientific work and with other interesting historical bits of information hidden in there. Information like the original purpose of 'stuyk manden' or brewer's baskets. And mechanical developments (mash extractors) that made this mashing method easier to conduct and at some point, allow brewers to overload their mash tuns even more. These extractors can still be seen at some lambic producers and I'll update this blog post with a picture of one if I am able to visit the right breweries in the coming months (for now check out the Timmerman's mash tun pictured in this Drink Belgian Beer post). The copper disks are extractors for pulling out wort. 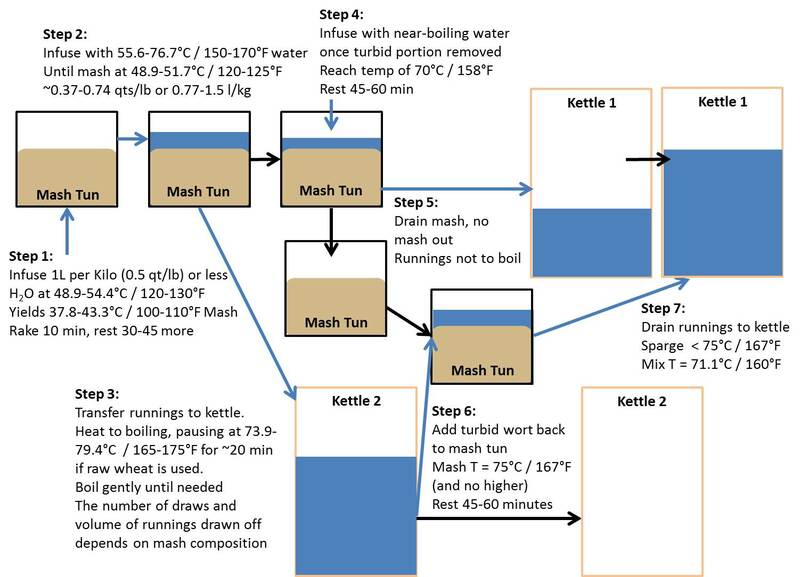 The system Johnson is describing is type of turbid mash. Johnson describes this as a 'modern turbid mash' and it seems pretty similar to what one might call a 'modern turbid mash' now as well. It might differ slightly from the 'Cantillon-type' turbid mash many might be familiar with, but in essence it is very similar. It is also similar in some ways to the mash described by Evans (and Johnson notes that this type of mashing was also employed in Northern France, so it makes sense that Evans describes something similar for Bière de Garde). Goals: Perhaps goals isn't really the proper word here as it may not be the initial goals the Belgian brewers had in mind when they devised the system. Rather Johnson is discussing the reasons why he is recommending the mashing system/advantages he sees in it. This mashing system is good for producing unfermentable wort for low strength beers so that they don't end up too thin. And in addition Johnson believed that the wort from such a mash both tasted better than a simple infusion mash of the same grist and that the wort was better for the yeast. While this sort of mashing can be well suited for mixed fermentation beers (as we know from lambic), Johnson describes the beers that formed the basis of this text as being consumed rather young. -As a note before the steps, Johnson mentions in the text that the infusion temperatures may not seem to agree with the final rest temperatures stated. He explains that this is because of the thick iron mash tuns needing a lot of heat to warm up as well as a lot of heat loss from stirring and the mash tun design. So the temperatures really do work out this way, but applying it to modern equipment will need some adjusting (probably meaning use cooler water rather than less because of the mash already being on the thick side to start). 1) The mash starts with a cool (100-110 F / 37.8-43.3 C) and thick step with less than or equal to 1.5 barrels of water per quarter of malt. A quarter of malt is somewhere on the order of 336 lbs, so this means something like 0.5 quarts per pound (1.0 l/kg). When using raw wheat this step is carried out a bit cooler (note that this trend of 'if wheat the cooler' is true for many of these steps and Johnson mostly deals with a no-wheat scenario). Starting so cool helps to prevent a stuck mash, an especially important precaution when finely milled raw grain is used. The rakes are used for ~10 minutes and then the mash is allowed to rest for 30-45 minutes more. This allows the production of soluble proteins, swells the grain, and develops acid (both phosphate-system from phytins and microbially produced lactic acid). 2) Following this cool dough in/rest, 1-2 barrels of water per quarter (on the order ~0.37-0.74 quarts/lb, 0.77-1.5 l/kg) at 150-175 F / 65.6-79.4 C are added to bring the temperature up to 120-125 F / 48.9-51.7 C. Again, if raw wheat is used then this step is a bit cooler. 3) When the mash is up to temperature the first turbid portion is withdrawn. The rakes are not stopped for this turbid pull, which suggests that the turbid portion might be a bit chunkier than one might expect from seeing a modern turbid mash in action. Johnson reports that the volume and number of pulls varies (more raw grain means more pulls, if all malt maybe only one pull). The removal of ungelatinized starch from raw grain (or poorly malted grain) here helps to prevent stuck mashes as well. This turbid portion is heated to boiling in an extra kettle. If raw wheat is used, the turbid portion may be allowed to rest around 165-175 F (73.9-79.4 C) for about 20 minutes to allow some conversion to take place before boiling destroys the enzymes. After this the turbid portion is brought up to boiling and gently boiled until it is needed. 4) For all malt beers, an infusion of boiling water is used to raise the mash to 158 F / 70 C once the first turbid portion is withdrawn. The mash rests here from 45-60 minutes. Johnson notes that this saccharification temperature is higher than standard for English beers and he suggests that starches in Belgian malts may resist conversion at lower temperatures, possibly due to needing to be gelatinized. 5) The rest temperature yields a more dextrinous wort, which is drawn off to the boil kettle without a mash out. 6) After the mash is drained, the turbid portion is added back to yield a mix temperature around 167 F / 75 C. To hit this temperature cold water is added or the turbid portion is allowed to cool before it is added back. Johnson mentions that brewers were careful not to exceed this temperature. This mixture rests for 45-60 minutes and then it is transferred to the kettle. The previous wort in the kettle has still not been heated and the mix of the two runnings is about 160 F / 71.1 C, so enzymes remaining in the non-turbid runnings could act on any unconverted starches in the turbid wort. 7) The mash is now sparged normally with the sparge water being no hotter than 167 F / 75 C. It seems that the mash is mixed to some degree before sparging (suggesting this is more like batch sparging than fly sparging) and also that hulls are used to promote good flow. Fermentation - Johnson lists typical attenuation levels for Belgian beers which are quite low. Much lower than the modern concept of Belgian beers as light-bodied, highly attenuated beers. Many of the beers which are the driest (saisons, lambics, etc.) would not fall into the category of 'typical Belgian beer' so they likely wouldn't be included in the sorts of attenuation ranges listed. But it is interesting to note that low attenuation was common for Belgian beers. Johnson lists typical apparent attenuation levels of around 66% and with 75% being too high. Again, keep in mind that this is speaking of beers drunk young and of more standard low-strength beer types. Johnson also notes that pitching temperatures were on the warm side compared to English brewing, with yeast pitched at ~68 F / 20 C during winter. There is an interesting discussion at the end of the text regarding yeast mutation and what makes a Belgian yeast different from a British one. There is possibly a bit of fanciful thinking and/or not clearly describing what is meant by some statements, but it is an interesting read either way. Belgian sugar - In discussion with another brewing scientist, Johnson mentions that Belgian sugar producers felt that it was important to include non-fermentable material in their products. And therefore that the use of Belgian sugar in brewing may not have dried a beer out as much as we would suspect based on modern sugars. English sugars at the time of this text are discussed as being fully fermentable. Storage: The beers brewed by the method that Johnson was describing were all consumed fully attenuated but young (fermentation was not stopped early so the real, albeit high, FG was reached). Johnson does note that some beers made by this method are susceptible to spoilage by wild yeasts. He also notes, as it pertains to how the beers kept, that lower strength beers from a given brewery which were brewed by this method tend to do better than higher strength beers. Johnson is pretty firm with saying that wort from the same malt tastes notably better with this turbid mashing system compared to a more normal infusion mash. Regarding the applicability of this sort of mashing to making highly attenuated beers - we know it works well for lambics. It might be interesting to try it in modern dry low strength beers like petite saisons, where a bit less attenuation might not be awful and where highly attenuative yeasts are being used. Also, with modern malts conversion would happen more quickly and therefore following this sort of procedure would yield a more fermentable wort now that with typical Belgian malt of the time of this article. I've generally not been a fan of high mashing temps for low fermentability in saisons or many mixed-fermentation beers (this is somewhat yeast-dependent) but the uniqueness of this procedure and the forgiving nature of lower attenuation in petite saisons makes this an attracting idea to me for at least a try. I think then, at least starting with beers that are intended to see a bit of aging with a mix of microbes, and perhaps some cleaner but really low OG beers, this sort of system is worth a try. And I plan to give it a go when I am back to brewing.